I read a nice article yesterday on Facebook about how its writer beat her battle with an eating disorder and what turning 30 means to her this year. I guess I’ve read enough articles to know what I should and shouldn’t do, and how life springs forth the minute we let go of the ED. The journey, however, is one that tends to make the ED sufferer feel like they are at the losing end, especially at the beginning. Endless days of feeling disgust at gaining weight, bloatedness that never seems to go away, self-loathing at how ill-disciplined they may feel at exercising less and eating more. Isn’t there a saying that goes, “A journey of a thousand miles begins with a single step“? That first step is often the hardest to take no matter how many people may be egging you on, shouting endless encouragement and giving boundless support to you. In my mind, it’s always easier to think that tomorrow will make all the difference. Truth is, it never does. Thursday evening, Flo decided to take me out for dinner. Only a couple of months ago, I considered Japanese food as pretty much on my ‘safe’ list. Yet, I found myself feeling horrible about what I’d eaten. 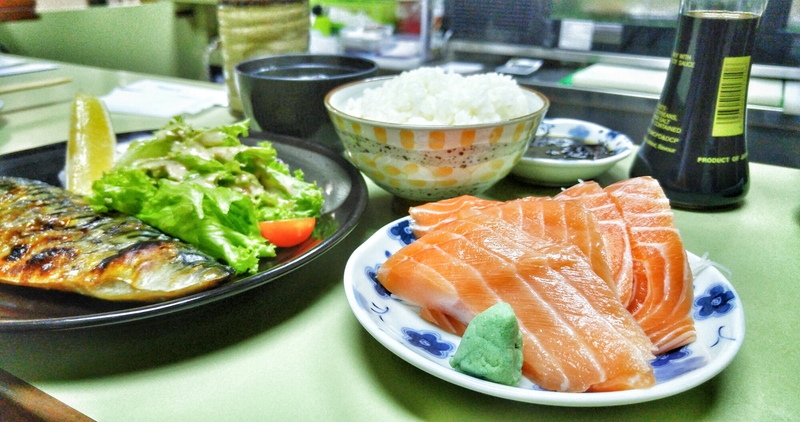 We’d shared a portion of Chawanmushi, Salmon Sashimi, and a Saba Shioyaki Set. I usually love sashimi but Wasabi Tei, the restaurant we went to, cuts theirs in generous, thick slabs. And while I enjoyed it, ED didn’t. All I could think about after was how much salmon I’d just ingested. I know how blessed I am in that Flo never holds back on telling how much he loves me. And almost every day, he will remind me that he will accept me in whatever shape or form I come in simply because he loves who I am. I joked that if that were the case, then he should be perfectly happy with the shape and form I am in at present, but of course, I know that he means it doesn’t matter how I look as long as I’m healthy. It’s funny how everyone can tell me that I am enough and mean it, and yet, I remain so harsh on myself. Every so often, Mum reminds me that I have so much going for me – a wonderful man, parents who support me unconditionally, a little business in baking that I love running, a good degree that I can fall back on, and uhm.. usually she adds good looks to the list as well but I’m a little embarrassed to put that in although I kind of just did. At what point do we say to ED that enough is enough? At what point can I tell myself that I am enough? Not long ago, I read an excerpt from Beating Eating Disorders’ Facebook page that I happened to start following a couple of weeks back. One part read “You could be seconds from dropping dead and it (ED) will still tell you, you are not sick enough… It’s a life-threatening mental illness with one intention: to kill you“. Completely true. How much more do I have to lose before it’s enough for ED? It will never be enough. I have to realise and accept that I am enough without relying on ED for approval of my own self-destruction. I no longer have reason to hold on to a disorder that only puts me in good standing to lose all that I have around me right now, and dangles false promises to me that somehow life will be perfect if I lose a bit more… and a bit more… and a bit more. Previous articleI Love.Downs and The Aunty Life. Next articleI Love.The Bigger Picture.